Deborah Jones, Studio #12, in Deer Harbor, is bringing on color in her vibrant Venetian plaster and gold leaf paintings this year. Deborah colors plaster on demand, and applies and burnishes each layer using steel trowels and mechanical buffers. This year, saturated colors in vibrant abstract compositions imbue her work with certain energy, and, draws the eye to the colors that surround us. The multi-layered process brings another level of depth to the work creating translucence between colored layers. Gold leaf captures and reflects the slightest light. Inspired by the bold colors of Southwest Colorado and the subdued light of Orcas Island, Jones brings a career of design to her paintings. She is the principal of her design firm DH Jones Design and shares her industry knowledge and design solutions with clients at Bluebird Builders. 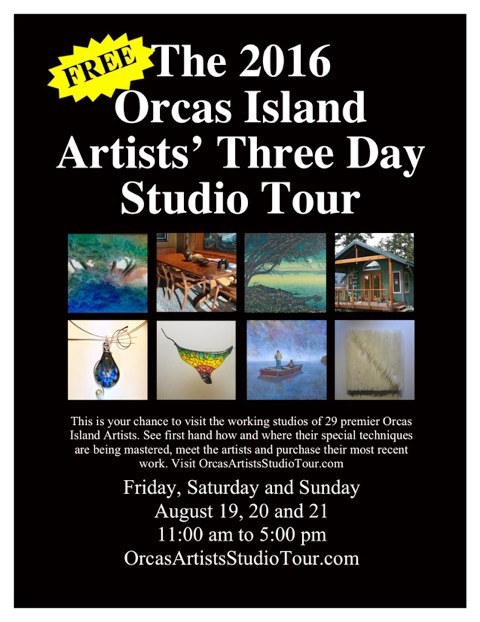 Be sure to visit Deborah in her studio, and see her works bring bare walls to life in her home this weekend.